I spend a couple of hours in a car daily as I commute from Gurgaon to my work place in New Delhi. Last week, as I was on my way, I started thinking about how so many songs have been picturised in modes of transport – cars, cycles, jeeps, boats, trucks, lorries, trains, bullock carts, horse carts (tonga/ ghoda ghaadis) and even chariots (Mera Salaam le jaa, as an example of that)! The vehicles, per se, are an important character in these songs. So I thought of doing a post, rather as a continuation of my cycle post, on my favourite ‘vehicle’ songs – with one song representative of each vehicle. But as I started drawing up a shortlist, the list turned out to be too long. So, for my convenience, I decided to restrict this song list to just ‘car’ songs. After all, it was in a car that I got this idea. Like bicycles, cars have featured in many many songs. All the songs would have to take place for at least 80% in a moving car. Now, as I started drawing up a preliminary short list, I noticed that the list contained mainly Shammi Kapoor and Dev Anand songs (Sigh! Can’t help it if so many gorgeous songs were picturised on these two actors!) But, since this is a car post and not a Shammi/ Dev drool post, it was time for another restriction. No actor would feature in more than one song. (There is one exception – Guru Dutt. But well, he isn’t singing in either, so should not count!) So here are 10 of my favourite ‘car’ songs. Now, in the case of Shammi Kapoor and Dev Anand, some of the songs omitted are also ones I like very much and would have ideally figured here – so they shall have to feature in a separate list someday, which would be only about these two actors. 1) Babu samjho ishaare (Chalti ka naam gaadi, 1958, Kishore Kumar and Manna Dey, S.D. Burman): Starting the list with the quintessential ‘car’ song featuring the Ganguly brothers. A paean to their khatara car, this madcap song has the brothers traversing through the streets of Bombay. 2) Kisi na kisi se kabhi na kabhi (Kashmir ki Kali, 1964, Rafi, O.P.Nayyar): If I were to pick 5 songs, all picturised in different vehicles, 3 songs would be from this movie. This particular song has Shammi Kapoor in a car, driving, singing, dancing through the pretty landscape of Kashmir, looking for true love. There is also the classic Yeh chand sa roshan chehra (where Shammi serenades the pretty Sharmila on a boat). And then there is that delightful Subhanallah haseen chehra, with Shammi disguised as a Pathan woman, wooing Sharmila in the back of a truck! Shammi Kapoor probably had the most number of songs picturised on him in a moving vehicle. Hmm, the reason why this particular car song makes the cut over other gems like Raahi mil gaye raahon mein (Dil deke dekho) or Yeh rang na chhootega (China Town), is because this is from the first Hindi film I ever saw! 4) Yeh lo main haari piya (Aar Paar, 1954, Geeta Dutt, O.P. Nayyar): One of my favourite Shyama songs ever sung by Geeta Dutt, this one has the gorgeous heroine trying to manao her rootha hua boyfriend who is a taxi driver. She threatens to jump, makes eyes at him, pleads and generally tries hard to calm him down. Lovely. 5) Haye unki woh nigahein (Aakhri Dao, 1958, Asha Bhosle, Madan Mohan): The bashful heroine is in a taxi with her friend and is describing the eyes of her beloved, not knowing that he is driving the taxi! It is playful and delightful, sung beautifully by Asha Bhosle and picturised on a pretty Nutan. 6) Unse rippi tippi ho gayee (Agra Road, 1957, Mohd Rafi & Geeta Dutt, Roshan): This delightful duet was on my shortlist for the cycle post, as a part of the song has been sung by the cyclists. There are lots of cycles and a car and a truck in this song. It also has a pretty Shakila and a charming Vijay Anand. Didn’t have the heart to leave it out again… so here goes the song. 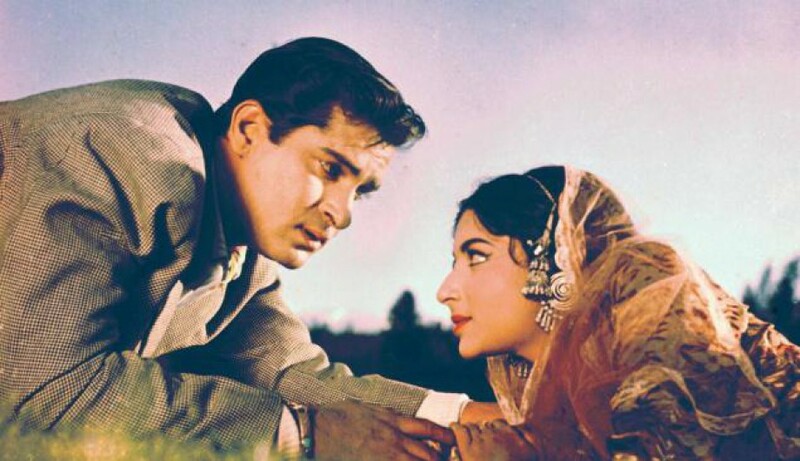 7) San san san woh chali hawa (Kaagaz ke Phool , 1959, Asha Bhosle & Mohd Rafi, S.D. Burman): This has a whole bunch of people off on a picnic. The entire song is in transit, and the singers themselves are in some sort of a vehicle (a truck? tempo? van?) while there are two people in a car, listening to this song of love. Waheeda Rehman looks so very beautiful. I was a little iffy about this one. It is in because I did not want to list a Shammi or Dev Anand song in its place! 8) Jab dekh liya woh chhupenge kahan (Chirag, 1969, Mohd Rafi, Madan Mohan): Next is a song that reminds me of my favourite song picturised on any vehicle – Pukarta chala hoon main. Since that one has Biswajeet on a jeep, it is not here in this list. But this song has many similarities with Pukarta chala hoon main. The singer is the same – Mohd Rafi and just like the other song, Asha Parekh is perched prettily on a cycle and is wearing pink. Here the hero (Sunil Dutt) is on a car, in a car and standing in front of a car! 9) Bahaaron ki baraat aa gayee (Yakeen, 1969, Mohd Rafi, Shankar-Jaikishen): Dharmendra is happy, off on a journey, seeing his lady love everywhere in the rearview mirror. He even gets a flat tyre on this journey and changes the tyre. Wonder how his sparkling clean, white trousers do not get dirty at all. 10) Chala jaata hoon kisi ki dhun mein (Mere jeevan sathi, 1972, Kishore Kumar, R.D. Burman): Ending the list with a song that is in the same carefree vein as the previous one, but one that is so much more popular! The music by R.D. Burman is splendid and so is Kishore Kumar’s rendition. 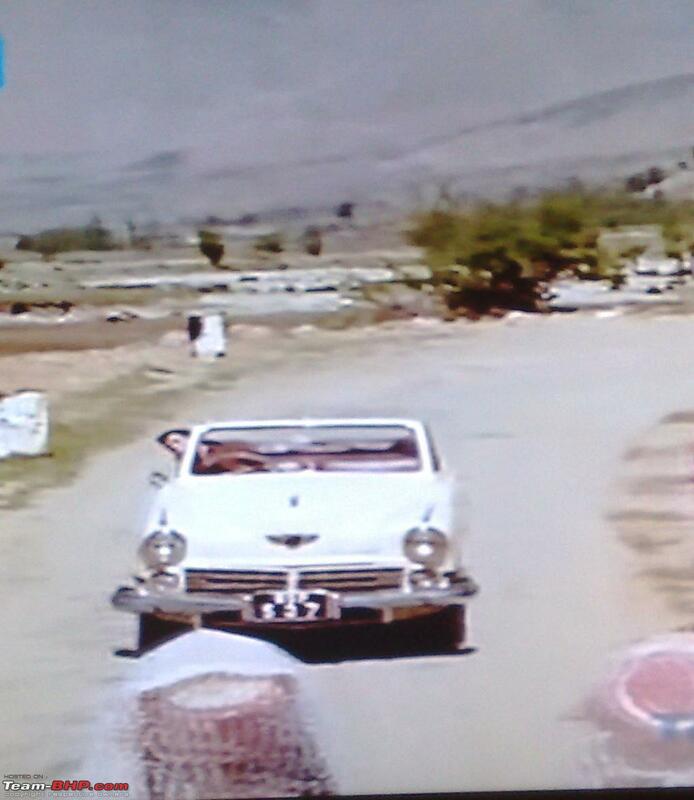 It is picturised on the then superstar, Rajesh Khanna who is driving and is dreaming about Tanuja. This entry was posted in Old Hindi songs and tagged Aaar Paar, Aakhri Dao, Agra Road, Asha Bhosle, Asha Parekh, Ashok Kumar, Babu Samjho ishaare, Bahaaron ki baraat aa gayi, Chala Jaata hoon, Chalti ka naam gaadi, Chirag, Dev Anand, Dharmendra, Geeta Dutt, Guru Dutt, Haye unki woh nigahein, Jab Dekh liya, Jeevan ke safar mein raahi, Kaagaz Ke Phool, Kishore Kumar, Kisi na kisi se kabhi na kabhi, Lata Mangeshkar, Madan Mohan, Mohd. Rafi, Nutan, R.D.Burman, Roshan, S.D.Burman, San San woh chali hawa, Shakila, Shammi Kapoor, Shankar-Jaikishen, Sharmila Tagore, Shyama, Sunil Dutt, Tanuja, Unse Rippi tippi ho gayi, Vijay Anand, Waheeda Rehman, Yeh lo main haari piya. Bookmark the permalink. You’ll be pleased to know I have heard San San San woh chali hawa before. Enjoyed reading your post H.
When I read that bit about two Guru Dutt songs, I guessed which ones they’d be, then thought No, it can’t be San-san-san woh chali hawa, because the people in the car aren’t singing. And Harini left out Unse rippi-tippi ho gayi from the cycle post because the people on the cycles weren’t the only ones singing… glad to see you did include San-san-san woh chali hawa, because I love that song so much! 🙂 I love San san san woh chali hawa too; though I was not too sure about including this song in this list – exactly for the reason that the people in the car were not singing. But all the other ‘car’ songs I really like were Shammi Kapoor or Dev Anand songs – Rahi mil gaye raahon mein, Yeh rang na chhootega, or Jiya o Jiya kuch bol do. Aah, how could I forget Gaadi ko chalaana babu! You introduced me to it a couple of months back. This is not a great song, but it has Madhubala driving. Thanks, Anu 🙂 Aah Tum jo mil gaye ho… I had completely forgotten this one…I dont like Priya Rajvansh or Navin Nischol, guess thats why. The Madhubala song and the Meena kumari numbers were on my shortlist… But I dont particularly like either very much… So! Ha ha, If I had not stuck to the one hero one song restriction, my list would have been filled with Shammi Kapoor and Dev Anand songs!